Ponytail palm trees are not a species of palm but are actually a member of the genus Beaucarnea and are native to Mexico. They are highly drought resistant and can suffer from excessive watering. Ponytail palm trees grow to about 8 feet in height in containers and form white or yellow flowers. The foliage is dark green and whip-like, similar in appearance to a ponytail, hence the name. Ponytail palm trees can live for up to 30 years if given the proper care and maintenance. Plant ponytail palm trees in partial shade during the spring. Use a planting medium that is two parts gardening soil and one part peat moss to increase drainage. Water immediately after planting to compact the soil. Allow the soil to dry slightly between watering. The soil should never be saturated with water or completely dry. Apply water twice a week during the growing spring and summer seasons, and reduce to once per week during winter. Feed ponytail palm trees once a month during spring and summer using a balanced 10-10-10 NPK fertilizer. Water the tree immediately after feeding to prevent potential root burn from the nitrogen. Do not feed in winter while the plant is in its dormant period. 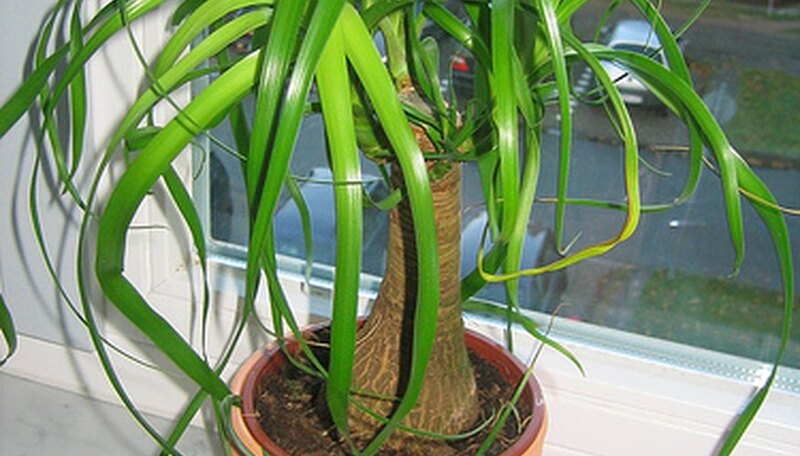 Use a damp cloth to wipe down the leaves of the ponytail palm once every two weeks. This will remove any possible eggs laid by pests, and will also help leach excessive fertilizer salts from the soil. Check the stem of the ponytail palm regularly for soft or dark spots, which can indicate root rot. Cease watering if any spots are observed, and wait for one to two weeks to allow the spot to heal. Resume watering once the root rot has vanished. Browned leaf tips are commonly caused by unbalanced watering. Water the ponytail palm on a regular schedule to ensure the plant is healthy and receiving the proper amount of moisture. Ponytail palm trees can be grown outside but only in climates with minimum winter temperatures between 45 and 50 degrees Fahrenheit.